Semiconductor devices are omnipresent – not just in microchips, but also in solar cells that convert light into electrical energy, and in many other applications that are part of daily life. Organic semiconductor materials have also been the subject of increasing research and development over the past few years. Their electrical properties can also be changed by the intentional incorporation of a tiny number of foreign atoms or molecules that enable their conductivity to be precisely set. However, for modern applications one also needs so-called p-doped semiconductor layers as well as n-doped layers, which are then combined in a device. N-doping of organic semiconductors is extremely difficult, though. The class of organic dopants employed for n-doping react readily with oxygen and water, as present in normal environmental conditions. 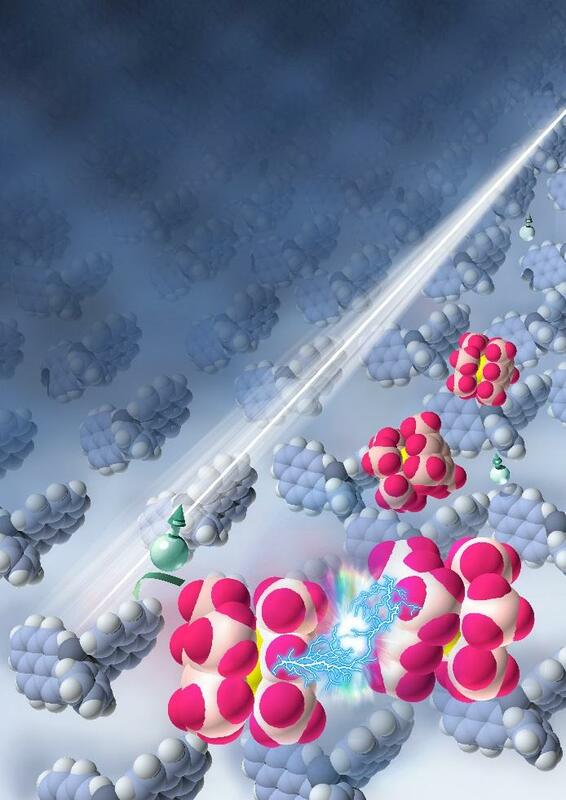 A German-American team has recently published a paper in Nature Materials in which they demonstrate a new approach for doping organic semiconductors with n-type donor molecules. Groups from the Georgia Institute of Technology, Princeton University, Humboldt-Universität zu Berlin, and from the Helmholtz-Zentrum Berlin joined forces in this work. The new approach consists of two primary steps. In the first step, organometallic molecules, the n-dopants, were connected into what is referred to as a dimer. This molecular couple is far more stable compared to the individual dopant molecules, and can be easily incorporated into the organic semiconductor; however, the dimer itself is not suitable as an n-dopant and does not release any negative charges. The revolutionary second step consists of illuminating the mixture. The incident photons break the dimers, in a multi-stage chemical process, into the individual organometallic molecules again, which then effectively n-dope the organic semiconductor. "By activating the dopants with light, we were able to increase the conductivity of organic semiconductors by five orders of magnitude. This could considerably increase the efficiency of organic light-emitting diodes and solar cells", says Prof. Antoine Kahn from Princeton University, who coordinated the project. "Our approach enables far simpler manufacturing of n-doped organic semiconductor materials used in diverse applications. The critical step in the process – that of breaking the dimers with light to activate doping – can be done after encapsulation so that the active dopant molecules are never exposed to air. This will also increase the operating lifetime of devices that rely on n-doped layers", explains Prof. Norbert Koch, who heads the joint Molecular Systems research group of HU Berlin and the HZB.